NEW YORK—The new, long-awaited bike share program in New York City is set to launch Memorial Day weekend, the last weekend of May, according to the Manhattan Chamber of Commerce. But some remain cautiously optimistic about how the program, which will distribute 6,000 bikes to 330 stations throughout the city, will pan out. “We love the bike share idea, but the communication could have been better,” said Nancy Ploeger, president of the Manhattan Chamber of Commerce. Many of the enormous, long gray bike rack stations for the bike rental program have been installed with little warning in locations that business owners and building tenants formerly used for deliveries, parking, loading docks, or as their garbage pickup locations. “In some instances these businesses were not informed and didn’t have a chance to weigh in and say that this is where I put my trash, this is where I take my deliveries,” said Ploeger. She added that many businesses are concerned with getting fines from the Sanitation Department when they are forced to put their trash in a different location. Jacques Capsouto, owner of bistro Capsouto Freres in Tribeca, said he was disappointed in the lack of communication between the City’s Department of Transportation (DOT) and the public. 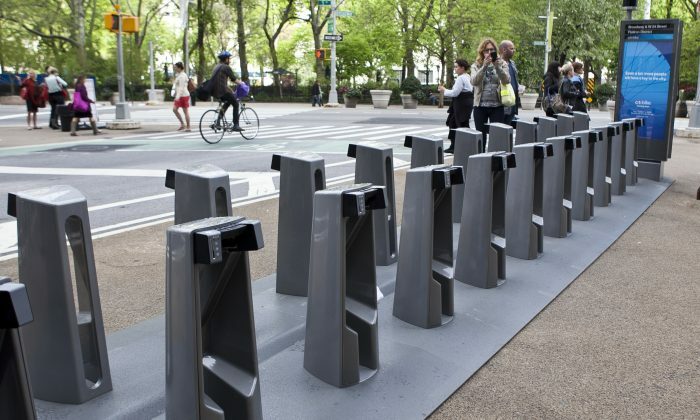 Capsouto said that although he is a public member of the Community Board, he was never notified of when, where, or how many bike racks were coming. “They just came one morning,” he added. Capsouto said his restaurant has been trying to reopen ever since Hurricane Sandy struck. They are still in the middle of figuring out insurance, and the bike racks have added a new load of anxiety for the owners. He said he would have liked to have been given a chance to provide his input. According to the DOT website, the racks are not intended to be used for long-term parking. DOT is also offering bike corrals—where rows of racks can be installed on the curbside lane of the street rather than the sidewalk. Anyone can request a bike corral, but the city is not responsible for keeping the corral clean of snow and debris. Applications are available on the DOT website. The DOT could not be reached for comment regarding the communication between the department and community boards. The Citibike program, named for its main sponsor Citibank, has begun placing racks throughout Manhattan, from 66th Street down to South Ferry, and into western Brooklyn. The program calls for an expansion after the initial launch phase to 10,000 bikes and 600 stations. The only currently functional bike share stations are in Brooklyn Navy Yard, where people have been using the bikes to cover the long distances they used to walk. The bike share program will operate on a rental system with memberships available in varying lengths, the longest being a one-year membership costing $95. Even though the bikes aren’t available yet, enrollment for membership is open. According to Citibike, there is already popular demand among New Yorkers for the bikes. A promotional founding member program for the first 5,000 applicants has already sold out. Several ramps on the Brooklyn Bridge that have been a major source of frustration for drivers for decades have been expanded. Flushing Meadows Corona Park is currently home to three contentious construction proposals involving a mall, a soccer stadium, and a parking garage. New York City has finally joined other major metropolitan locations around the world that have public bikes for rent.